It started as a typical morning for Baker A. Bass. He awoke and left his home at 74 Ellis Street at the regular time. Bass walked to work at four in the morning everyday to open his shop the Babb Commision Company at 113 Peters Street. He would always dress and leave quickly, having his breakfast delivered to work by one of his four children or his wife. She said Baker said goodbye and left the family home on the morning of August 30th, 1895 in a great mood. Bass had a typical route he walked and that dawn was no different. As daylight was over the horizon and the streetlights still provided the only usable light, the pudgy commission man ambled a block up Ellis, crossed Ivy Street and turned right on the west sidewalk of this thoroughfare, today known as Peachtree Center Avenue. Bass headed north on Ivy and stepped by an abandoned lot with a high embankment covered with weeds. 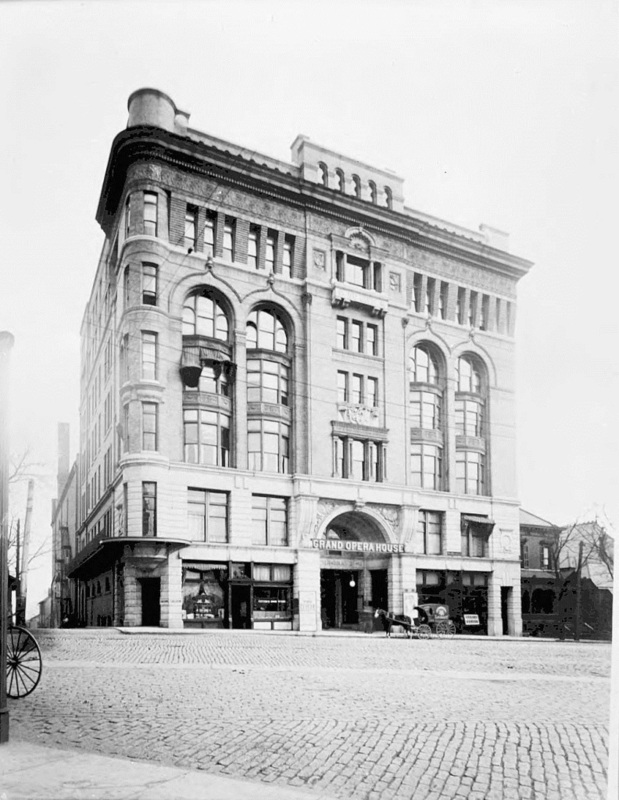 It was cut on the north with an alley that ran west from Ivy over to Peachtree, right past DeGive’s Grand Opera House, which would later become Loew’s Grand Theatre. This area is now the Peachtree Center entrance to 191 Peachtree Tower, home of Atlanta’s historic Commerce Club. When Baker passed the high embankment the shadow of a man emerged from the weeds and quietly slid down the hill. He crept up behind Bass and violently grabbed him from behind by the collar, right as he crossed the Opera’s alley. When the attacker grabbed Bass his buttons popped from the front of his shirt, his hat came flying off and his coat collar was torn. The pair struggled. The shadowy assailant had a pistol and the shopkeeper pulled out his own. As the two grappled with each other one of the guns fired. So a morning that started typically for Baker A. Bass ended atypically. And since Bass was not a typical man, the following inquiries into his death dominated the newspapers. Each news story was consumed by the Atlanta public during the later part of 1895, into 1896 and beyond. The investigation revealed a “Gang of Thieves” that moved stolen Atlanta goods across Georgia. It involved dozens of characters, including an ill-reputed lover, a outspoken baker and a sly private eye. But the biggest revelation was shocking. It revealed an Atlanta detective force that was on the verge of implosion. 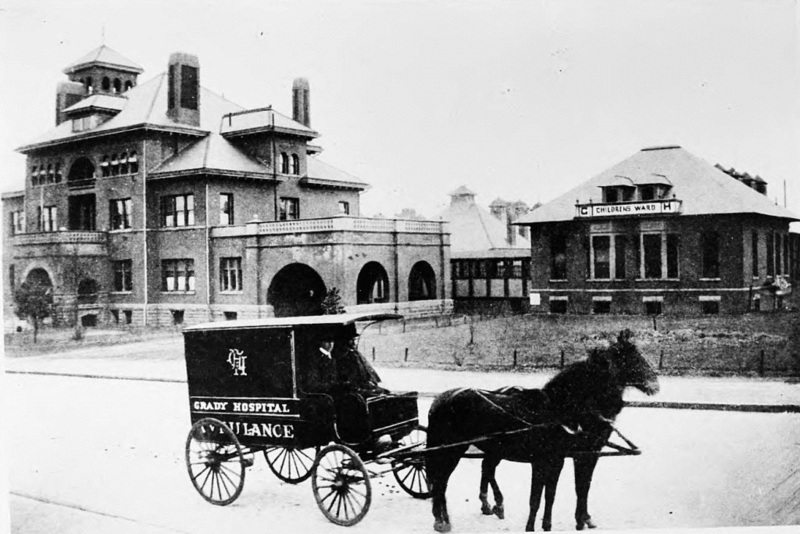 One could say the Baker Bass murder confirmed the “ugly rumors about the station house” that had bounced around the Atlanta public for years before 1895. The case brought scrutiny and awareness that drastically changed the special unit of gumshoes within the Atlanta police department that cut corners to convict, freelanced on the side and operated with impunity. 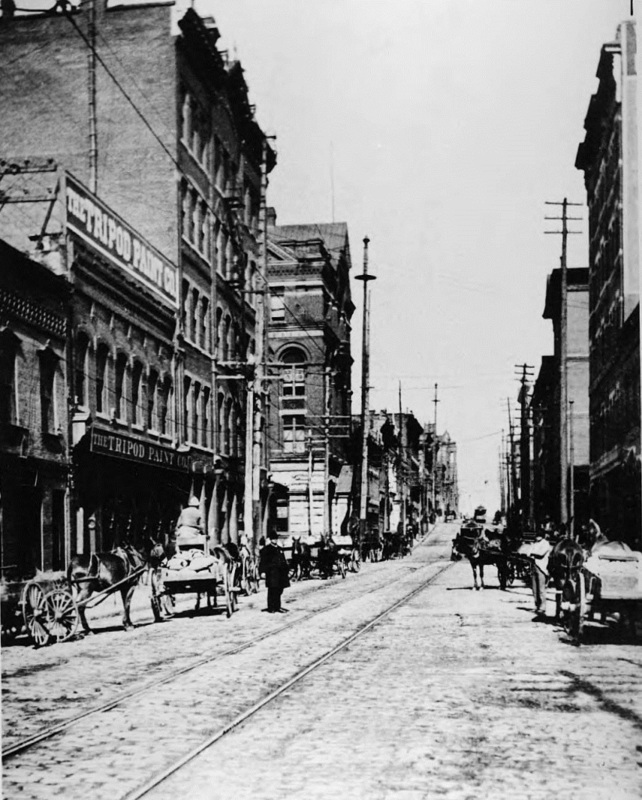 Baker Bass had been in Atlanta five years before he was murdered in late August 1895. Before coming to the city, Bass had been a merchant in Thomasville, Georgia, where he started as a clerk in a general merchandise store, married the daughter of a prominent citizen and eventually opened a store of his own with his rich father-in-law. His Thomasville store was called Bass & McKinnon and for several years was a successful enterprise. After nearly 23 years in Thomasville he left in disgrace. The firm he operated failed and while he was described to be “active, energetic and pushing”, Bass still owed money to people when he moved to Atlanta around 1890. Two months earlier police charged Bass with two cases, one prosecuted by Detective Will Mehaffey, and a second prosecuted by Detective Green Conn (the charges were brought June 28th and July 2nd, respectively). The Mehaffey case concerned a large amount of Wild Turkey tobacco stolen from a Southern Railway Company train car. The Conn case involved a barrel of stolen lard. The pair of detectives had discovered that the Babb Commission Company operated by Baker Bass was a “dumping grounds for thieves” in and around Atlanta and claimed a search warrant of his store had produced a stolen gold watch. Detective Mehaffey also claimed he tracked a barrel of stolen overcoats, along with the Wild Turkey tobacco, to a Mr. Scarborough in Monk, Georgia. Scarborough’s bill for the goods indicated he had purchased them from Bass. The Conn case concerned a thief named Christopher Columbus Johnson, known as C.C., who broke into Brannan Brothers, a wholesale grocer on East Alabama Street, and stole a barrel of lard. Detective Conn found the barrel broken behind the Babb store operated by Bass. In that case, Detective Conn immediately had enough evidence to convict C.C., who was given a four month sentence or a $50 fine. Unable to pay the fine, C.C. Johnson served his time for the lard theft in a local convict camp. It was about two months before the murder when detectives had enough evidence to confront Bass. Detectives Mehaffey and Conn insisted Bass broke down under the pressure and confessed. Thieves, both black and white, would bring their stolen goods, both large and small, to Bass, who would then sell the stolen goods to buyers across Georgia, both aware and unaware. The crooked storekeeper promised that if detectives would hold up his trial Bass would give them his entire “Gang of Thieves”. Curious about taking down this nefarious network, detectives let their cases stand. But after two months, when Bass produced nobody, the detectives brought both cases to a grand jury. The charges included car breaking and receiving stolen goods. According to detectives, Bass was despondent over the charges, felt cornered and killed himself that Friday morning. The first day after his murder detectives were trying to convince the press and the public it was a suicide. That was the story the detectives spun. But there were many holes in the suicide theory expounded by Atlanta detectives in the days after the murder. Baker Bass was first found by a young African American teenager named Will Coleman. He discovered Bass most likely within ten minutes after he had been shot. 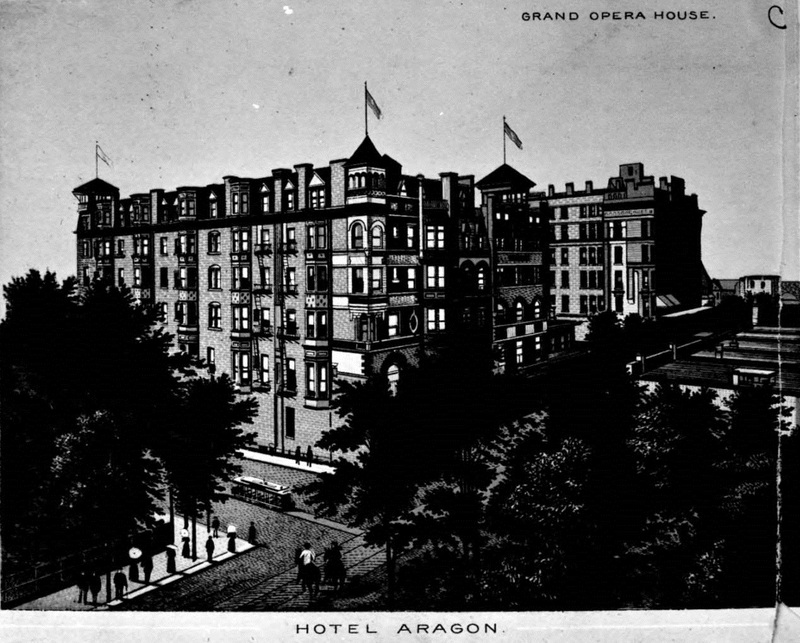 He was a porter at the nearby Aragon Hotel, a huge and luxurious hotel that sat right next to the Grand Opera on the corner of Peachtree and Ellis (it was razed by 1932). It’s not clear if Coleman either didn’t hear the gunshot, or was a complete dumbass, but he thought Bass was drunk or sick. But Coleman had just passed two police officers, and he had enough sense to go run them down. Officers Thompson and Moncrief were on their beat in the middle of what they called “Darktown” near Courtland Street and Houston Street when they heard the gunshot (Houston is now John Wesley Dobbs). The Atlanta police officers were going block to block trying to find the source of the gunshot, and not having much luck, when they were approached by Coleman at the corner of Houston and Piedmont. The officers new him as a porter at the Aragon. Coleman brought them to Bass who was lying behind the Aragon and Grand Opera on Ivy. The young porter explained he thought Bass was drunk or sick, because he was groaning. Officer Thompson said it was about 15 minutes from the time he had heard the shot to the time he was shown the body by Coleman. Bass was lying on the sidewalk with his feet hanging off the curb, his hat knocked off and his head in a pool of blood. In Baker’s hand was a .44 caliber pistol. Moncrief rushed away to call an ambulance and Thompson bent down and removed the gun from Baker’s grasp. Having a few moments to examine it, Thompson found it had two loaded chambers and three empty rounds. “I will swear positively that the pistol I found in his hand had not been fired that day,” testified Officer Thompson in a later trial. Thompson would be one of the strongest flaws in the theory that Bass committed suicide. He smelled the weapon for gunpowder, and was convinced it hadn’t been fired. He also observed that Bass was not robbed, his gold watch and chain clearly visible. A crowd had gathered around Bass, who when awake was “gasping for breathe, groaning with the throes of intense agony” and “he tried to talk but couldn’t.” One of his sons arrived right as an ambulance pulled up, tipped off by one of his father’s workers who had seen the crime scene and recognized Baker’s hat. Bass was rushed to Grady where he would come in and out of consciousness, never saying an intelligible word. Doctors examined the wound and were certain Bass would soon die. His family brought him home to 74 Ellis Street where he passed away around noon. The doctors at Grady, along with the coroners that conducted the autopsy, were all convinced Bass was shot by someone else. Doctors that admitted Bass noted it looked as if he had been in a scuffle, with his shirt and coat almost ripped off from behind. Coroner Paden even had an opportunity to examine the gun and said he found lint in the barrel and couldn’t smell any gunpowder. The doctors also pointed out the lack of extreme damage to the skull and singed hair around the wound typically seen with gunshot suicides. They theorized the weapon had been fired from between one to three feet away from Bass. Striking him above the right ear, the doctors thought this would be an almost impossible shot for Bass to pull off by himself. The Atlanta detectives didn’t care. For the first few days after the murder their official theory was suicide. A day after the murder police presented several “witnesses” that said they saw Bass shoot himself and his body fall to the ground. Police also awkwardly released a statement from a Dr. Carnes to the press that said three weeks before Baker Bass had come to him despondent. Supposedly Bass admitted to Carnes that he was going to have his credit ruined by upcoming charges. In his opinion Bass was suicidal. While Carnes would later testify in a few of the trials that concerned the Bass murder, his testimony was never convincing. And the “witnesses” that came forward saying they saw Bass take his own life eventually were fully discredited, publicly admitted they lied and disappeared into history. While detectives were pumping the story of suicide, the Bass family, his friends and lawyer had a different theory. The people closest to Bass insisted he was murdered by members the very detective force that was tasked with investigating his demise. Mrs. Bass put up a $300 reward for information about the murder. She then gathered the body of Baker Bass and traveled by train with her children back to Thomasville to bury him in Laurel Hill Cemetery. While the body was buried in Thomasville, the Baker Bass murder would not disappear from newspaper reports in Atlanta. Almost immediately the press presented two theories: the detectives’ theory of suicide juxtaposed with the Bass family’s theory of murder. As early as September 1st a friend of Bass named C.T. Hughes came forward and said police had been threatening Bass, but he couldn’t identify exactly who on the police force had made the threats (or maybe Hughes, described as a simple yet outspoken baker that worked at Jack’s on Alabama Street, didn’t want to stick his neck that far out and say a detective’s name). Then on September 5th it was reported in the Atlanta Constitution that Charles Camp, the lawyer for Baker Bass, was securing sensational evidence of a conspiracy against the murdered man. Camp was gathering sworn affidavits that specific Atlanta detectives were conspiring to convict Bass, paying convicts and other individuals $25 each to testify the storekeeper was buying and selling stolen goods. Detectives were scared of prosecution or dismissal for failing in the Bass cases. Camp came public and indicated he had been gathering evidence against police even before Baker Bass was murdered. Camp insisted he and Bass were going to present these witnesses to the grand jury on Monday, but Bass was murdered on the Friday morning before. Camp was convinced the detectives were behind the Bass murder. The attorney was determined to secure testimony of Bass family friends who indicated the now dead storekeeper was harassed and threatened by Atlanta detectives leading up to his murder. So who killed Baker Bass? Was it Atlanta Police detectives? While five detectives were involved, the police, press and inquiries focused on the two detectives that had the most interaction with Bass: Green Conn and Will Mehaffey. The pair released a joint statement written by the younger Mehaffey and confirmed by the older Conn, telling the story of how they caught Bass and his confession, finishing the statement with a “there was no ill feeling between us and Mr. Bass” line. Unfortunately for the detectives the joint statement printed in the press wasn’t enough to distance themselves from the murder investigation. Over the course of September 1895 Conn and Mehaffey were involved in official grand jury inquests and police board investigations. And while Camp’s initial claims of coming sensational evidence were true, the affidavits and testimonies he secured were a tangled mess of circumstantial evidence. Many of the affidavits concern Detective Conn and bribes. One from a man named Charley Smith stated that Conn was willing to pay $25 if Smith could provide testimony that would help convict Bass of buying and selling stolen goods (there were others like this one, including a statement from a broker named Young Gresham, a friend of Bass). Another Camp affidavit came from C.C. Johnson, who admitted he stole the Brannan Brothers lard and broke down the barrel behind the Babb Commission Company. But after a verbal exchange with Bass that ended negatively, C.C. sold the lard to a man that was from outside Atlanta and not to Bass. He asserted Bass was not crooked. And through September 1895 the attorney Camp secured affidavits that concerned Conn and Mehaffey threatening Baker Bass. During a grand jury inquest he presented this evidence, and C.T. Hughes again presented his story that Bass told him police were threatening his life. The Hughes testimony hit the courtroom like a bombshell. Camp continued his roll, rotating witnesses such as V.A. Shaw and H.T. Jenkins onto the stand, both friends of Bass who provided statements that it was Detective Conn that wanted to kill the storekeeper. H.T. Jenkins probably shouldn’t have stuck his neck out in this case; he was arrested on September 20th, 1895. Police revealed he was one of the “Gang of Thieves” and they were charging him with stealing the Wild Turkey tobacco three months before along with the murder of Baker Bass. According to police, Jenkins killed Bass so he couldn’t reveal Jenkins’ role in the Wild Turkey tobacco theft. Jenkins was never tried for the Bass murder, instead going to jail on other charges. While convinced he was a one of the thieves, police became disillusioned with theory that Jenkins was the actual killer. All of the work done by Camp really went nowhere; it was all circumstantial evidence that was considered ballyhoo by the press and public. In one of the grand jury inquests Camp even called his own brother to testify. Atlanta detectives lawyered up and went silent. None of the testimony provided by Camp, though sensational, was incredibly damning. The Baker Bass murder was turning into a confounding mystery. By October 1895 the press, public and police thought the murderer of Baker Bass would never be caught. It seemed as if the case was going to drift quietly away into Atlanta history. While it looked like no one would ever be caught for the murder of Baker Bass, that changed in May 1896. Remember C.C. Johnson, the lard thief? On May 23rd, 1896 newspapers reported police had captured him and were charging him with shooting down the merchant. Overnight, the murder recaptured the Atlanta public’s attention. Police considered Johnson one of the sharpest criminals in Atlanta. Detective Hewitt, the officer in charge of the Bass investigation, was convinced they finally had the murderer. It appears Hewitt also convinced Atlanta Constitution reporters that C.C. 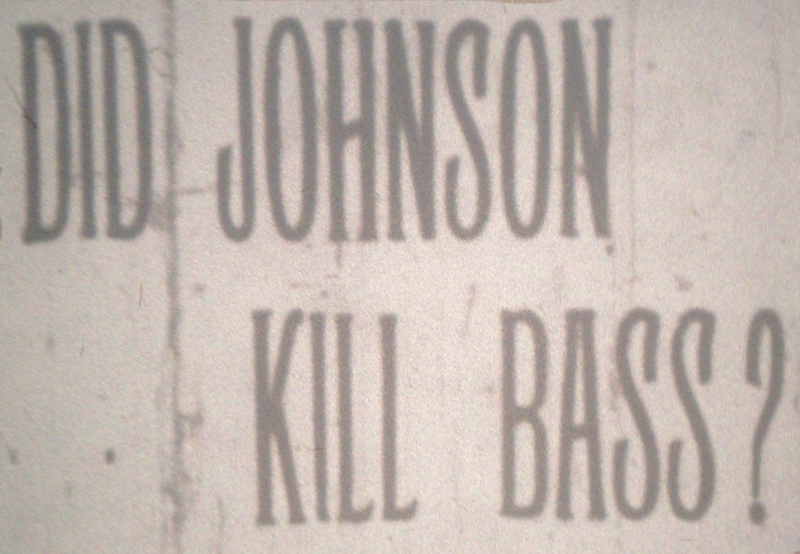 Johnson murdered Bass. The newspaper publicly attacked Johnson, clearly using race and prejudice to sell his guilt to the white Atlanta public. Constitution writers referred to Johnson as the “mean” and “one-eyed” killer that had been on the chain gang many times and was “a hard man to handle.” They described him as rather heavy set “with the complexion of a well-done ginger cake” and was a “fairly well educated” school teacher. Writers focused on his appearance and sometimes used the n-word to describe him, which certainly happened in real life 1895 Atlanta, but wasn’t typical for an Atlanta Constitution article of the time. Brought to police headquarters at 12 o’clock, within two hours a grand jury had charged C.C. with the crime. Why did it move so quickly? Because of testimony from witnesses accumulated by Charlie Calhoun, the African American private investigator that had trolled Atlanta bars and saloons, running down tips about the murder of Baker Bass. What followed was a superior court trial in July 1896 that offered a slew of witnesses that Calhoun had tracked down, supposedly explaining why Baker Bass was dead at the hands of Johnson. 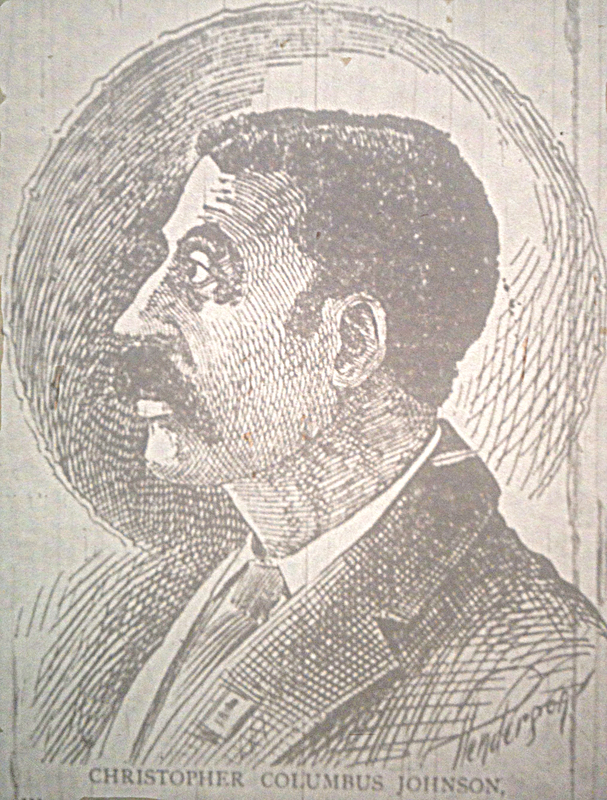 While the white Detective Hewitt was heralded by the press for solving the crime, it was the work of the African American private investigator Calhoun that made the trial against Johnson possible. The major witness was Sarah Scott, a former lover of Johnson. She stated that in late April 1896 C.C. was at the Atlanta stockade for burglary. It was the lard case, where he broke into Brannan Brothers on East Alabama Street. C.C. was given a four month sentence or a $50 fine. Scott asserted that Johnson did sell the stolen lard to Bass, who still hadn’t paid him for the illegal transaction by the time he was in the stockade. As told by Scott, Bass had promised C.C. he would “pay him out with the $50” but for some reason failed to do so. It seems Bass didn’t want to get involved and felt C.C. should serve his time, even though Bass owed the thief money. By the time C.C. Johnson was serving his time in a prison camp outside of Atlanta he was desperate. Sarah Scott came to visit him and he again relayed a message to Bass: please pay my fine and get me hell out of this. When Sarah Scott delivered Johnson’s message, this time Bass openly refused to pay the fine. Scott reported this to Johnson, who was furious. He vowed he would fix Baker Bass if it was the last thing he would do. Captain Milan, owner of the county convict camp that held Johnson, testified the convicted lard thief was released on August 29th. The next morning Baker Bass would be shot dead on an Atlanta street. The timing was perfect. According to Sarah Scott, the night after the murder Johnson came to her home. He showed her a gun and admitted to murdering Bass. He wanted to flee Atlanta with her. But there were flaws in Sarah Scott’s story. More accurately, there were flaws with Sarah Scott. Under cross examination she was shown to have been arrested frequently, was a notorious drunk and was recently turned out of her church. The defense even called her pastor, who testified Scott should not be trusted. The second major witness was Jesse Jones, an elevator boy at the nearby Norcross Building. According to Jones, who supposedly waited several months before he started telling his story to people, he had heard the shot that killed Bass while on his way to work at the corner of Courtland and Ellis. He testified the “electric lights were burning” on the morning of August 30th, and there was just enough light to make out C.C. Johnson running down Ellis Street, away from the gunshot. But Jesse Jones also came with flaws. Under cross it was revealed Jones was getting out of a burglary charge for his testimony and several inconsistencies were shown in his story. Other witnesses were called by the prosecution that said they saw C.C. running down Ellis Street right after the shooting (oddly enough newspapers right after the murder reported a white man was seen running down Ellis, away from the crime scene). All of these witnesses were discredited similar to Scott and Jones, with a few revealed to be getting out of “blind tiger” charges for testimony. And all of these witnesses were shown to have been tracked down by Charlie Calhoun. The private investigator had accumulated a tangled web of evidence, but it failed to convict C.C. Johnson. That trial in July 1896 resulted in a hung jury. But Johnson wasn’t off the hook. Authorities immediately charged him again for the murder. The second trial would start in the middle of October 1896 and it proceeded just like the first. The defense presented shady witnesses that were each discredited by the defense. On October 15th C.C. Johnson was finally set free, found not guilty by the jury, many of whom he thanked while vigorously shaking their hands after the decision. Showing how the case had galvanized the Atlanta African American community, a crowd carried C.C. Johnson out of the courtroom in victory. Johnson would return to public scrutiny on June 8th, 1897, when he was sentenced to six months in public works for larceny. But he was never again charged with the murder, even though he was always linked with the crime. He most likely did it… It’s not like there were other people that had something to gain from the death of Baker Bass and the means to pull it off, right? Atlanta Police Detectives Green Conn and Will Mehaffey provide two contrasting studies of how police power in 1890’s Atlanta could lead to corruption. Or more accurately, while their paths were quite different in length and experience, both Conn and Mehaffey ended up as corrupt, and then disgraced, police officers. Green Conn was a seasoned law enforcement officer. 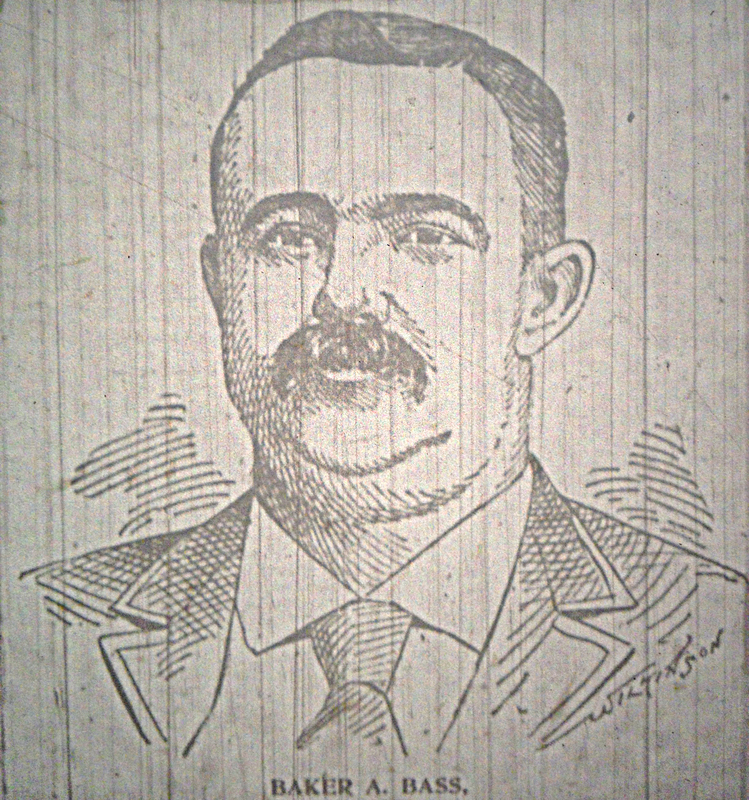 The former Chief of Fulton County, Conn left that role in December 1894 and became an Atlanta detective. Conn was shrewd and smart, only occasionally surfacing in news after the Bass murder (like when he found foot of a man that had blown himself up in 1897). Laying low and staying out of the spotlight eventually failed for Green Conn, and in 1899 it all started falling apart. In June of that year Green Conn was tried before a police board for jury tampering. While Conn won this case (the most serious result was a Captain Joiner was suspended for being intoxicated at the police barracks) it was not lost on fellow authorities that the jury tampering charges were quite close to the paying for testimony charges Green Conn had faced with the Bass case. They started to investigate Conn and immediately discovered problems that extended to Conn’s boss, head of Atlanta detectives Captain Bradley Slaughter. Then, in August 1899, while rumors swirled about the investigation, Green Conn disappeared. Headlines in the Atlanta Constitution ran: Where is Green Conn? For several days his whereabouts were a complete mystery. But he suddenly returned on August 29th, 1899 and refused to say where he had been. It was bizarre. By September 1899 charges were brought against Bradley Slaughter and Green Conn, and a trial before the police board was set. Right before the trial, on October 12th, Conn resigned from Atlanta P.D. citing his involvement in the Slaughter investigation. He immediately plead guilty to fraud and offered evidence that implicated himself and Captain Slaughter. He stabbed his boss in the back. 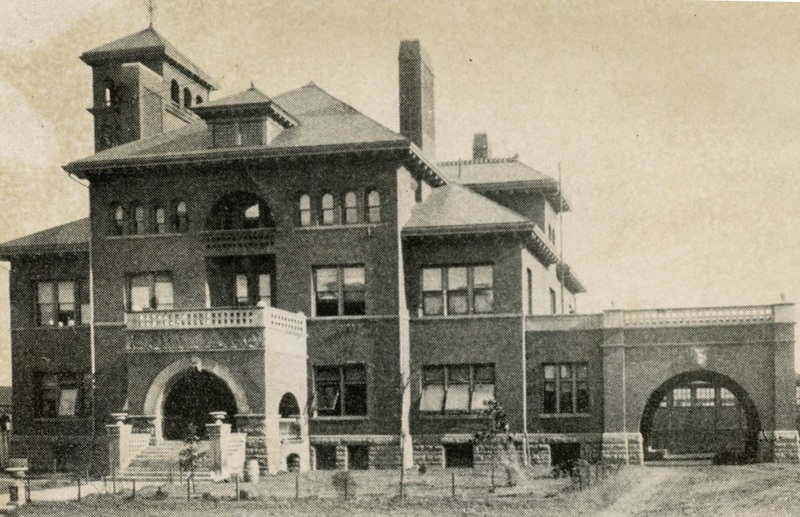 One of the incidents involved an Augusta divorce case that Conn worked back in December 1897. A man named Twiggs employed Conn through Captain Slaughter to find evidence he could use against his brother-in-law, a man named Taylor who was divorcing Twiggs’ sister. Slaughter and Conn created a false expense account that Twiggs eventually paid and Conn traveled to Macon several times to pursue the case, all while receiving pay from the city of Atlanta. Captain Slaughter ensured no one asked questions why an absent detective was receiving his regular salary. The side work was done during police time and Conn received full pay from the city. Slaughter and Conn split the $100 they received from Twiggs, along with the bogus cash in the expense report. They never found any evidence to help Twiggs’ sister. It was a pretty sweet racket. During his testimony Conn described other incidents very similar to the Twiggs/Taylor divorce: a private case was initiated by a client through Captain Slaughter; the pair created an expense report; Conn goes abroad to investigate all while collecting his regular Atlanta police pay and the client pays both Slaughter and Conn through the nose. Most of their clients were bondsmen, and most of the cases involved fugitives, such as a man named Fisher that was wanted for forgery. Conn chased Fisher to South Carolina, but never caught him. Slaughter got on the stand and impeached Conn as criminal. He denied all of the allegations, and totally attacked the reputation of Green Conn. Considering his past association with the Baker Bass murder, destroying Conn’s reputation was not a hard thing to do. Captain Bradley Slaughter was found not guilty in November 1899. The police board found Slaughter had only violated some rules. The only serious penalty? No more card playing at the police barracks. But it was the beginning of the end for Captain Slaughter. His story descended into a horrible spiral of bouncing checks for fines, charges of assault and battery of a doctor and in June of 1901 a sentence for 12 months to the chain gang for larceny. Ed Cook, the former private secretary of Slaughter, was eventually charged with forgery. 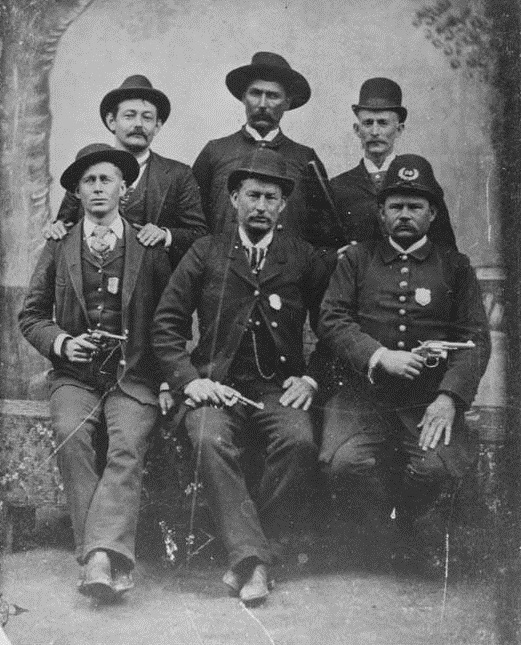 The whole detective force in the mid-1890’s seemed to be crooked. Green Conn used his connections with Fulton County to become a blacksmith. But one of the Adairs complained to the board of county commissioners and Conn was dismissed. 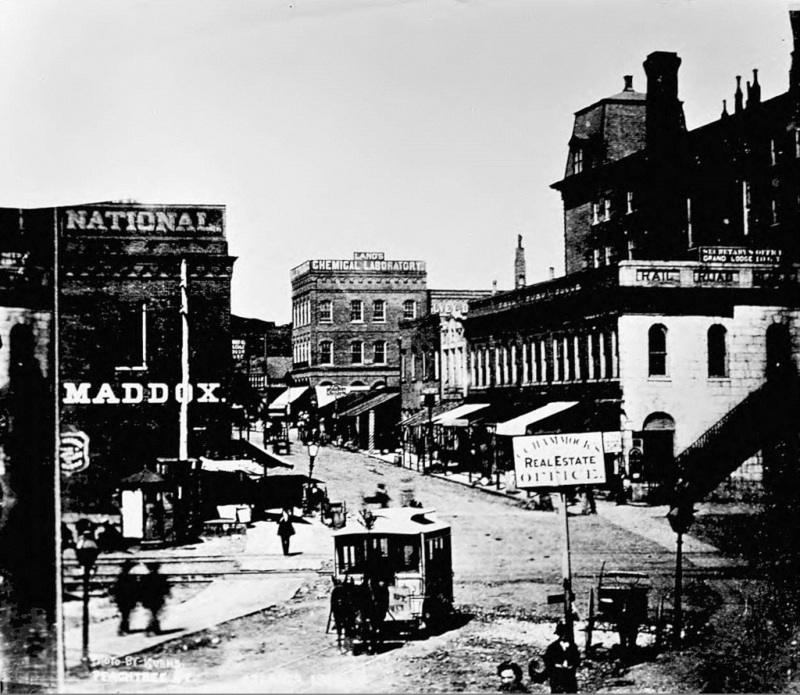 The old crooked gumshoe faded away into Atlanta history. Detective Will Mehaffey was the opposite of Green Conn. 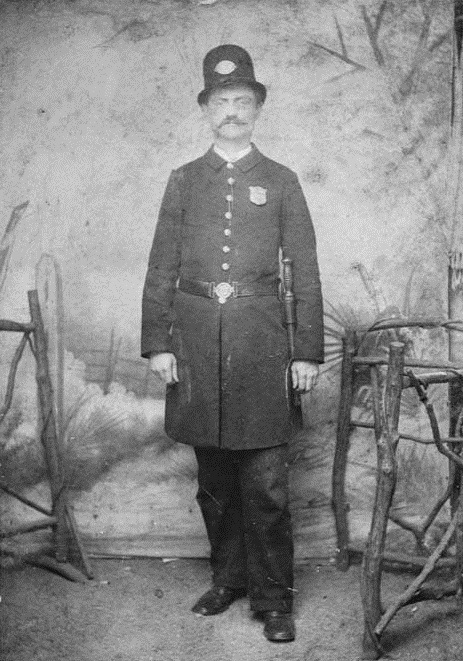 He was young, smart and energetic, and in the early 1890’s was known as an intelligent officer that was blazing up through the ranks of Atlanta police. In February 1892, as a regular beat police officer, Will Mehaffey arrested three murderers at once. The youngster had a knack for catching killers, with stories regularly running in the Atlanta Constitution about him capturing this killer, or tracking down that killer. In February 1893 he shot and killed a burglar. Regularly breaking up trouble, Mehaffey was quickly promoted to detective. For several years he was well regarded in this role, but at some point began to drink and lead a “fast life”, as newspaper reports stated. For Mehaffey his life as an Atlanta detective started to unravel right after the Baker Bass murder (unlike Conn who was able to hold it together a little bit longer). 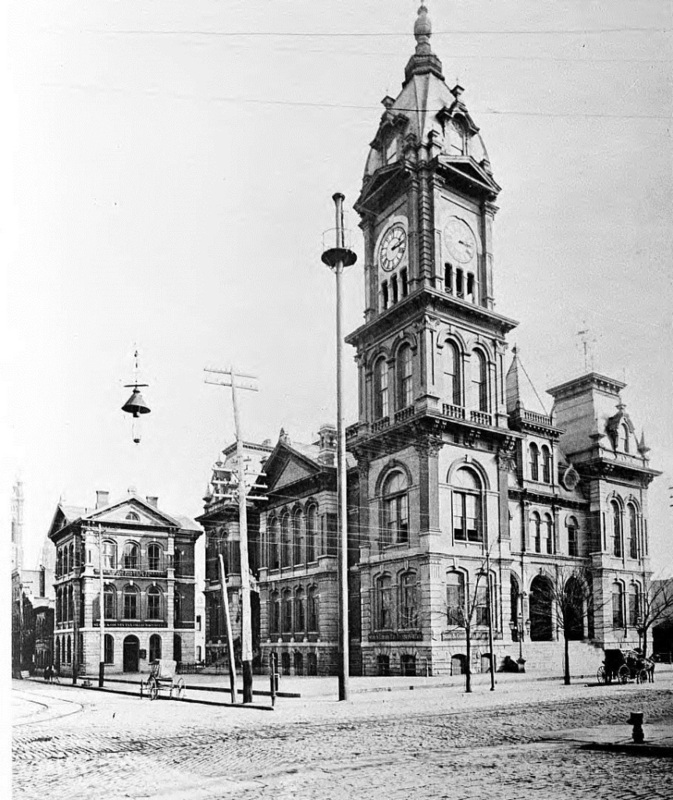 On November 28th, 1895, Will Mehaffey was suspended for receiving stolen money. Unable to return to the force, he became a private investigator. In June 1896 Mehaffey was found not guilty of stealing from the mails (he claimed he found the check he cashed). Reporters noted peculiar features of the case and how the former rising police star was falling apart. He was now officially a seedy private investigator, and the work he received from that point on delved into the the illegal. In May 1899 Mehaffey and another private eye named Shin were charged with trying to influence a jury. A newspaper story described Will Mehaffey as “a young, fine looking man, and in his palmy days had many friends in this city.” It described how he lost his place with Atlanta police and went into private investigator work. Then in 1901, while doing that seedy private investigator work, Mehaffey was thrown in the Tower for trying to bribe a witness. Sound familiar? It was while he was in prison for this charge that he was approached by a man named Chub Wall. Wall was charged with the murder of a man named Chris O’Byrne. Mehaffey worked out a deal for some cash with Chub Wall and the former Atlanta detective testified that he had heard another prisoner, someone other than Chub Wall, confess to the murder Chris O’Byrne. It was a lie to clear Chub Wall from murder. But guess what? It didn’t work, and authorities found out about the deal. On August 30th, 1901 Will Mehaffey received a sentence of five years in the penitentiary for perjury. Other than Mehaffey’s involvement in a 1904 case where, as a prisoner, he helped get the confession of a killer while in a convict camp, there’s no more mention of Mehaffey in the news. After this prison camp incident, like Green Conn, Will Mehaffey faded away into Atlanta history. Nobody would ever be convicted for the murder of Baker Bass. Charges of police corruption were never proven in the Bass case, but the officers involved were certainly shown to be corrupt. 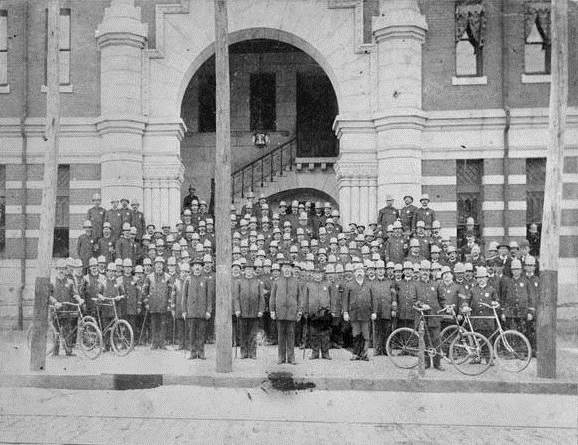 In fact, it revealed the leadership of all Atlanta detectives was corrupt in the 1890’s. And what about the “Gang of Thieves”? It was known by his family and friends that Baker Bass was going before the grand jury that following Monday. Did a thief other than Johnson catch wind that Bass was going to turn in his network of thieves, murdering the storekeeper that Friday morning? Maybe a thief like H.T. Jenkins? And what about C.C. Johnson? If you believe Sarah Scott, he had a pretty good reason to be pissed after rotting in a convict camp for several months. In the end, we will never know. Just one of the many murders and mysteries that the history of Atlanta provides. Did you like this story? Check out other stories from History Atlanta in the Mysteries and Murders category here. Jarita Hillenburg liked this on Facebook.